Izakaya Mita, a Japanese tapas restaurant, plans to open at the northwest corner of Damen and Armitage avenues this fall, according to a sign in the window at 1960 N. Damen Ave.
BUCKTOWN — A Japanese eatery that will serve small plates is coming to the southwest corner of Armitage and Damen avenues in Bucktown this fall. 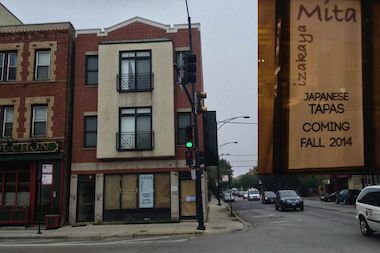 Izakaya Mita, Japanese Tapas will be exactly what its name suggests (in Japanese, that is): a casual spot to grab a drink and a bite at 1960 N. Damen Ave. The second part of the restaurant's name pays homage to Shiyouji Mita, the former manager of an iconic Japanese steakhouse who passed away in 2010. "This is for my husband," said restaurant owner Helen Mita. The 65-year-old widow said it was her husband's dream to open a restaurant and "we are making that happen," referring to herself, her son, Brian Mita, and Chef Toshi Motegi, who previously worked for her husband when he managed Ichiban at Broadway and Belmont in the 1980s. Ichiban was a favorite dining spot for the 1985 Chicago Bears, according to a Sun-Times obituary. while Shiyouji Mita worked at a business consulting firm. The two friends stayed in touch and wanted to open a restaurant together at some point. Helen Mita, who lives in Vernon Hills and also operates a nail salon, reached out to Motegi a few years ago. "It is so exciting to be part of this," she said. The centerpiece of Motegi's kitchen will be a Bincho, a type of Japanese charcoal grill that is used to cook steak, chicken, fish, scallops, shrimp and vegetables. In addition to grilled items, the eatery will also serve beef and pork sliders on buns made from rice. Though the restaurant will not offer sushi, there will be a sashimi and a salad topped with sashimi, in addition to noodle and rice dishes, Helen Mita said. Brian Mita, who currently works at a Japanese restaurant in Vernon Hills, will serve as the bar and dining manager and will find Japanese sakes as well as Japanese and American beers for the spot. Izakaya Mita's entry into the area follows other independently-owned ventures. "At one time you had smaller mom-and-pop shops closer to North Avenue and Damen and now there are a bunch of corporate brands there and they are pushing mom-and-pops north on Damen," said real estate agent Demetrius Simpson, who helped the Mita family snag the Bucktown location. A juice bar, 24 Karrots, is expected to open soon at 2004 W. Armitage Ave., across from Izakaya Mita, while around the corner, BFF Bikes recently opened at 2113 W. Armitage Ave.
Stitch, a home accessories and furnishings store, recent moved into a storefront at 1937 N. Damen Ave. after relocating from a shop two blocks south on Damen. Bucktown residents are excited about the prospect of a new restaurant too. "I'm about five small blocks away and I'm excited," said John Duncan, a 41-year-old voice engineer. "I love the sharing concept of tapas and Japanese food so it's a win for the neighborhood."